Analyzing U.S. congressional elections since 1972, Warrington’s method indicates that the most extreme gerrymander favoring Republicans was in the 1980 election in Virginia. For Democrats, it was the Texas election of 1976. In more recent years—2012 to 2016— his analysis shows Pennsylvania, Ohio and North Carolina strongly gerrymandered for Republicans, while Maryland’s and California’s voting districts have been strongly tipped in favor of Democrats. Warrington’s research was published March 12 in the Election Law Journal and could become an important tool—for both courts and legislatures—in the wake of a pair of U.S. Supreme Court cases now being considered that might outlaw certain partisan gerrymanders. Like the declination on a compass that shows the angle between magnetic north and true north, Warrington’s declination is also a simple-to-compute angle. It can reveal when a voting district plan treats the 50% threshold of votes—which is the difference between winning and losing, of course—as unusually important. If a state’s voting districts have been drawn without considering whether they will place a party over or under the 50% boundary, a plot of the districts from least Democratic voters to most (or vice versa for Republicans), should make a nice straight line. However, if the line takes a sudden turn at 50%, “watch out,” says Warrington, that can be a signal that districts were drawn unfairly, to claim more seats for one party than the other. In one example, Warrington has plotted out the results of the 2014 congressional election in North Carolina, above. The ten districts that were won by Republicans all hover in a close-to-flat patch ranging from above 30% to less than 45% Democratic votes, while the three seats that were won by Democrats were each captured by districts with well above 70% Democratic voters. The line to the “center of mass” of the Republican seats below the 50% line is shallow; above 50%, on the Democratic side, the line is steep. In other words, the strongly positive declination suggests that the districts in North Carolina were gerrymandered to favor Republicans. While Voting Rights Districts have been upheld by the U.S. Supreme Court, decades of cases built on a complaint of partisan gerrymandering—claiming that districts were drawn in favor of one or the other of the major U.S. political parties—have been almost entirely unsuccessful in federal court. However, in 2016, a circuit court ruled in the case of Gill vs. Whitford that districts drawn by Wisconsin’s Republican-dominated state legislature were an unconstitutional partisan gerrymander—and the U.S. Supreme Court took up the case last October. Then, in December, the high court added a second related case, Benisek vs Lamone, brought by Republican voters in Maryland. A ruling on both cases is expected this June. If the justices uphold the claims that either state's voting maps are unconstitutional, it could redraw American political life. A central part of the Gill vs. Whitford case, and topic of conversation among the justices during oral arguments, is a measure called the efficiency gap. 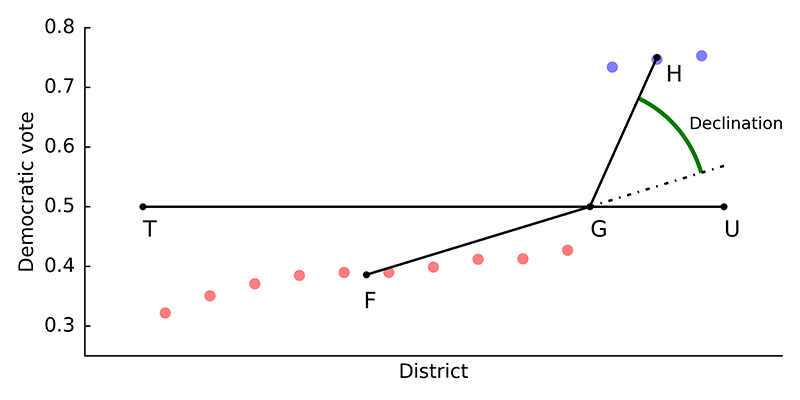 Instead of focusing on the shape of voting districts, this analysis considers the distribution of votes. It’s a newly developed mathematical approach that focuses on “wasted votes”—both those votes beyond what one party needs to win and votes cast for a losing candidate. As a recent report from the Public Policy Institute of California notes, “Partisan gerrymanders seek to foist more wasted votes on the other party,” making their own votes more efficient. If the party drawing the voting districts succeeds in this aim, they will “pack and crack” the opposing party: packing their opponent’s voters into a handful of districts that the opponent will win easily while evenly spreading—cracking—the rest of their opponent’s voters across a large number of districts that they will lose by small margins. While the efficiency gap has been at the center of the current Supreme Court debate, it “unfortunately, in its basic assumptions, requires proportional representation,” Warrington says—and proportional representation is not a constitutional right. (Just consider that Vermont’s Senate delegation has the same number of seats as California’s.) Which is where Warrington’s declination looks to be a better tool. If the Supreme Court rules that some partisan gerrymanders are unconstitutional, the declination—in combination with measures of compactness, an assessment of the intent of those who drew the maps, and a look at the impact of the redrawn maps—could be a “manageable judicial standard,” Greg Warrington says. Not only does it avoid “the constitutionality issue presented by the efficiency gap,” he notes, but it also “does not rely on the shape of districts, is simple to compute, and is provably related to the ‘packing and cracking’ integral to gerrymandering."